Tomato is in many ways unique vegetable, because the content of various nutrients beats all records. Regular consumption of tomatoes in food is a powerful shield, preventing the risk of many diseases. Growing tomatoes in his backyard – not an easy process. In order to grow a rich harvest, you must have an idea about proper preparation of soil; formation of bushes; diseases that affect the plant; watering and fertilizing. In each of these moments will be staying separately. To prepare the area designated for planting tomatoes, should have in the fall. The soil in this area should be generously enriched with nutrients by adding a lot of garden compost, crushed egg shells and wood ash. These substances are necessary for intensive growth of seedlings. In the spring, immediately before planting the seedlings, in the area enriched with the fall of ground, you should set props. As props you can use wooden posts, with a height of half to two meters. Backups need to dig into the ground in neat rows, and then pull the twine between them. After planting seedlings, it is necessary to carefully tie the twine. The correct formation of the Bush depends on how rich will be the harvest. In order to form a Bush, needed at the plant to remove lower leaves up to each ovary. Thus, the young plants will be 3-4 sheet, which will be enough for food and photosynthesis. It is important to know that pruning leaves is recommended only for plants grown in medium and Northern latitudes. In hot climates to do the pruning is not necessary, because the sheets needed to protect the plants from strong sunlight and excessive heat. Tomato – South, respectively, and heat-loving plant. Grows in middle and Northern latitudes, it becomes susceptible to many diseases: late blight, fungal lesions, apical rot, tobacco mosaic and others. The most important enemies trudging tomatoes – rain, damp and lack of heat. - pruning and shaping the shrub can be produced only when the plant dries up after a rain. The most well-known pests of tomato twine, which, if possible, to destroy: snails, caterpillars, Colorado beetles, woodlice. Tomatoes should be watered abundantly, but not often. Watering should be done only at the root, and try to avoid getting water on the trunk and stems, as this can cause fungal diseases. If you water the plant too often and rapidly, the fruit will have a watery taste. 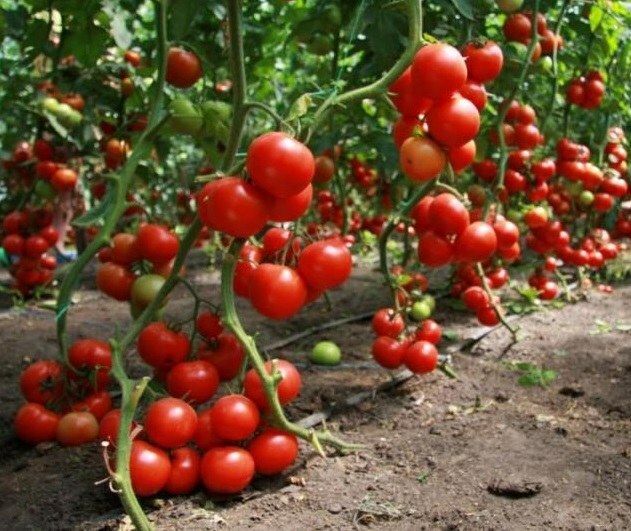 In order to harvest pleased, tomatoes should be fed by special fertilizers. Such fertilizers can be bought in any store of the type "gardening". Preference should be given to fertilizing with a high potassium content.